The United States Air Force Airmen of Note, premier jazz ensemble of the U.S. Air Force, will give a free performance on Monday, Nov. 15 at 8 p.m. as part of the 2010-11 season of Syracuse University’s Pulse Performing Arts Series. The concert will take place in Goldstein Auditorium in the Schine Student Center on the SU campus. The concert is free, however, tickets are required and are available at the Schine Box Office, (315) 443-4517. Paid parking is available in Booth and University Avenue garages for $4 per car. Pulse, presented by SU’s Division of Student Affairs, provides SU undergraduates and, in turn, the Central New York community with out-of-classroom opportunities to attend and participate in programs, performances, exhibitions and events in the performing and visual arts. In 2010, the Airmen of Note celebrates 60 years as one of the nation’s most revered musical organizations. The band was created in 1950 to carry on the tradition of Major Glenn Miller’s Army Air Corps dance band. Today, the group features 18 of the most talented jazz musicians in the country and is one of the last touring big bands, earning an international reputation as one of the finest and most versatile big bands of its kind. 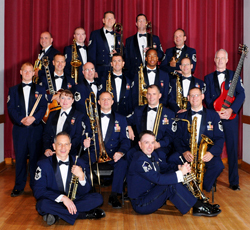 Through the years, the Airmen of Note has presented its exciting brand of big band jazz to audiences throughout the United States, in dozens of countries in Europe and Asia, as well as back home in the Washington, D.C. area. The band has collaborated on recordings and performances with such jazz luminaries as Dizzy Gillespie, Joe Williams, Sarah Vaughan and Nancy Wilson. In 1990, the group established the Jazz Heritage Series (featured on NPR and jazz radio, satellite and Internet stations), featuring concerts with legendary icons of jazz. Artists who have participated in the series include Clark Terry, Phil Woods, Kurt Elling, Paquito D’Rivera, Nicholas Payton, Karrin Allyson and others. The band’s Glenn Miller sound has remained a central ingredient in its musical heritage, but through the years it has also adopted a more contemporary sound, due largely to a talented stable of staff arrangers. Today, Master Sergeant Alan Baylock, the group’s current chief arranger, helps maintain a commitment to tradition and “cutting edge” innovation. For more information, e-mail pulse@syr.edu or call 443-2718.